The solid city gates of Troy slowly open. Hector takes one last glance at Helen's unearthly beauty, turns, dons his helmet, and walks towards Achilles. Everything is quiet. The people on the high wall are hushed. Even the birds seem reverent. Achilles stands motionless. The gates behind Hector close. The two warriors are now alone on the vast field.. Hector stops 20 ft from Achilles. Achilles , expressionless, stares at the prince. Hector: I'll make a pact with you with the gods as our witnesses. Let us pledge that the winner will allow the loser all the proper funeral rituals. Achilles: There are no packs between lions and men. Achilles removes then tosses aside his helmet. An insulting gesture, impugning Hector's combat skills. 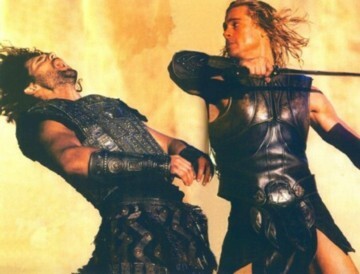 Achilles: Now you know who you're fighting. Hector hesitates... then removes and tosses his own helmet to the ground. Achilles: You won't have eyes tonight. You won't have ears, or a tongue. You'll wonder the underworld, blind deaf, and dumb. And all the dead will know... This is Hector.. the fool who thought he killed Achilles. Our July / Aug POTM was contributed by Jon Burgess of Felton, Delaware. He says of the photo..."During a recent trip to central Virginia, my wife and i decided to take some twisty back roads into West Virginia. 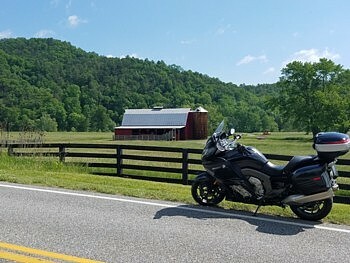 Along US 39, we saw this old barn along the road and just had to take a picture with my K1600GT. 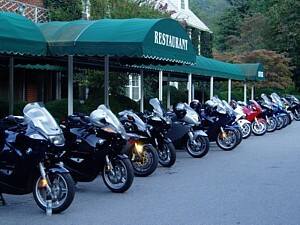 This ride was in mid May with beautiful riding conditions, weather was mid 70's with plenty of sun. The history is plentiful in this area with many battlefields and historic places to visit along the way. Picture was taken with my Samsung Galaxy S7 "
The I-BMW 2017 Texas Hill Country Rally! It Was a Good Year! We hear the 2017 Texas Hill Country Rally was yet another successful, incident-free event and we've got the pics to prove it! From the reports I've read, the weather was absolutely typical Texas.. Sun, rain, sun, rain with a smidgen of flooding. There was plenty of great food.. old friends.. spanktacular roads... and the hookers were noticeably better looking than last years. Isn't that what it's all about? A few trip reports are posted over at the quasi-sponsoring website... www.I-BMW.com We heard one unconfirmed rumor that not a single "velocity award" was achieved during the event...!!?? Can that be right?? Have we evolved into a bunch of underachievers? Say it ain't so!! A special thanks to James Myrick and his posse who helped organize the event and all the guys at www.I-BMW.com for putting together yet another successful gathering. Wish I could have been there. Hopefully I can some time in the near future. It's all about the finances these days. If interested/bored/bi-curious.. check out our Texas Hill Country Rally 2017 Photo Album. Thx to all the I-BMW.com miscreants who selflessly (and in some cases.. unknowingly) contributed photos to this year's photo album.. Tim & Susan, Lee & Debbie, and McFly in particular. Long live Texas!! I don't know if the impetus for pursuing this bike started by just the sheer desire to own one of the rarest modern-day BMW motorcycles, or from many who said it couldn't be done. I'd like to think it was the former, but it ended up being a combination of both. What started off quite casually, ended up being a tremendous amount of work, education, stress, disappointments, obsession and ultimately success. A true labor of love. Sunday, August 14, 2016, started off like any other day, until I received a Google search notification for a bike that came up for sale in a suburb of Toronto. It was for a 2005 BMW Montauk. 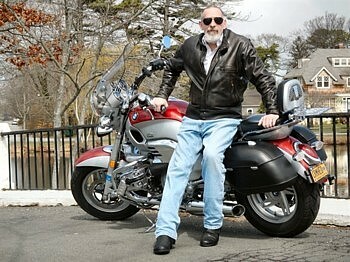 I presently own three BMWs; a 2002 R 1200 C Montana, a 2004 Montauk and a 2009 R 1200 RT. Being one of the Moderators of Chromeheads.org1, I eat, sleep and drink cruisers. About 44,000 cruisers were reportedly built between 1998 and 2004, with not too much data available with respect to exactly how many of each model were actually built. However, I did know that to memorialize the end of the cruiser line, BMW had manufactured 350 limited edition commemorative Montauks in a unique Piedmont Red and Silver color combination, with lots of extra chrome bits. I also knew that out of the total 350 produced, only six made it to North America. Those that did all ended up in Canada. Read the full BMWMOA.org article here. Akrapovic Exhausts: Back On The Pirates Lair Menu! A few years ago we at Pirates Lair sold Akrapovic exhausts. At the time I was very excited to offer the legendary brand thinking they'd be a welcome "anchor" product like Sears or JCPennys usually is at any mall. As it turns out... they didn't sell well. Could be due due to their high prices. Could be because Remus, Two Brothers, and Staintunes were generally selling at 1/2 the price. The recently crashed economy didn't help either. We sold 1 in the first year. After that lackluster showing, we dropped them, but I still get requests for them from time to time and more so as of late. A few weeks ago I called Kriega to place an order for some backpacks and was told that they had turned over the distributorship to a company called Upshift. Hmm. Never heard of them. I contacted Upshift, signed all the vendor paperwork for them to be our new Kriega supplier and set up an account with them. I casually asked what else they carry and amongst other things.. they also have the contract for Akrapovic. They told me the terms, set me up, and voilà.. Pirates Lair is once again carrying the entire line of Akrapovic exhausts. Sweet.. I'm hoping that when the economy turns around (and it will when the upcoming tax reform bill is passed) we'll start seeing a lot of new sales. Economy 101.. When cash is freed up .. customers will spend. BTW.. I didn't know this (and I'll bet you didn't either), but Akropovic is based in Slovenia and have their own titanium mine. Yes.. the titanium they use in their exhausts comes from their own mines.. Interesting, huh? Anyway.. I've been burning up brain cells over the last few weeks designing new web pages for the re-introduction of Akrapovic to our various menus. I'll be adding more in the weeks ahead.. If you have been wanting an Akra system and have a thicker wallet than my own.. please give us a shout. We've been given permission to match anyone's posted prices. Currently we have pages up for the following bikes.. BMW K1600GT/GTL, K1300S, K1200S, S1000R, S1000XR, K300GT, and slip-on kits for the S1000RR. I'll have RR full systems page up soon.. They offer a shitload of options for the RR. Some insanely pricey.. others reasonable. Staintune Exhausts: Back On The Pirates Lair Menu! Over the last week I've been gleefully updating our Staintune product line page to show their new offerings, marking the discontinued kits, and making price changes if applicable. I have most of the links back up and operating on our multi-hundred page website.. Good to go.. The bad news is.. Staintune is for sale. The notice is on their website. While they are looking for a buyer, the current owners will continue to manufacture kits and fill orders. We're hoping whoever the new buyer is will continue Staintune's long tradition of excellence and allow Pirates Lair to carry them here in the US. I absolutely love Staintunes. Hands down the best quality exhausts we've ever seen. That being said...we need a favor.. It took Amber and I months to get the word out that we were no longer selling the Australian Exhausts. Now, obviously, we need to reverse that and get the word out that we're back in the game. At least while the party lasts. If you hear of anyone looking for a Staintune exhaust for their bike.. please point them our way.. Help us spread the word..
A couple of weeks ago I noticed counter steering on my K1200S was taking more effort than usual. A quick check and sure enough another Michelin Pilot Power 3 front tire (my 3rd) was toast. Called a good buddy of mine who goes through Michelins faster than Congress goes through tax dollars and asked if the French company had a new version on the market yet. I always check before I buy. I'd been using the PP3's for a few years now (and love them) and I've been expecting an upgraded version.. Sure enough, a new Michelin is just now hitting the streets as a replacement for the aforementioned Pilot Power 3s ... it's called the Michelin Power RS. I'm still trying to get my head around what the Power RS brings to my two-wheeled world. This tire is not what I was expecting. I had expected a slightly improved version of the venerable Pilot Power 3. It's not. In fact it feels little like the Pilot Power 3 or any other tire I've ever ridden on and according to the published specs and tech-speak from Michelin, the tire isn't like any other tire. 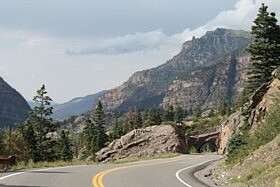 The first couple of times I ventured into the twisties I found myself missing my lines.. Old lines.. Familiar lines. Both entering and exiting curves.. WTF?! Had I installed it with the arrow going the wrong way? Was the air pressure off? Had I smoked one bowl too many last night? Then I realized the bad lines were due to pilot error. My fault. I had been steering and counter steering with the same tecnique and pressure I'd been using for years on the PP3s (and every other brand) which is waaay too much. The Power RS requires less effort, but a little more precision. It's disconcerting at first (at least it was for me,) but once you mentally dial in the amount of input needed... you can actually ride faster and in my case.. with more confidence. I attribute this to Michelin’s revolutionary new Adaptive Casing Technology or ACT. This new manufacturing process uses a single ply carcass at an angle close to 90° to reduce rigidity and increase grip at the crown of the tire, yet folds that single ply over on itself on each sidewall to stiffen it, resulting in less sidewall flex and better tracking through corners. Ingenious. Unlike the PP3 it replaces, the RS doesn't really fall into curves. It's very neutral similar to a Pirelli Corsa or SuperCorsa. Whether in a straight line or in the curves, the tire is as precise and accurate as the rider's inputs. You bend it into the curve with only a touch of effort and it goes EXACTLY where you want it. Precisely. Changing lines is effortless and drama-less no matter what lean angle. If you over-shoot your line, just re-direct and like a machine it corrects without pause. With the PP3s leaned over I always knew where the slide-out point was. It was very predictable and you could feel the loss of traction coming. Not so with the Power RS.. In fact, this is the first tire (street or track) I've ever ridden that made me feel like I actually have MORE rubber on the ground at full lean than when riding straight up. This sensation gives the rider Marquez-like confidence with less anxiety and/or seat pinching. I'm hoping this extra confidence doesn't get me into trouble at some point.. I have no doubt that on the track these tires (and the faith they instill) would translate into faster laps.. No doubt. On the street however where I already ride too fast, restraint (which I'm in short supply of) will be required. I've already caught myself entering familiar corners about 5-10mph faster than I usually do. Not sure if it's due to the new design, but the Power RS feels like it's a softer tire than the PP3. It's not as harsh over bumps. It's a very smooth riding tire. Are they really a softer tire? or does the new construction just make it feel that way? I have no freakin' idea.. Longevity is an unknown. While the tire has no rain grooves of any sort (see pic above).. Michelin says they are good in the rain. I never tested that claim. Rather than take my rabid enthusiasm at heart.. check out this performance spec chart comparing the new Power RS to the Pilot Power 3. It's pretty freakin' impressive.. Follow-Up 10/5/17: Now after months of diligent testing under both legal and quasi-legal conditions, my opinion hasn't changed much from my initial review although I have discovered an interesting "Gremlin" with these tires. 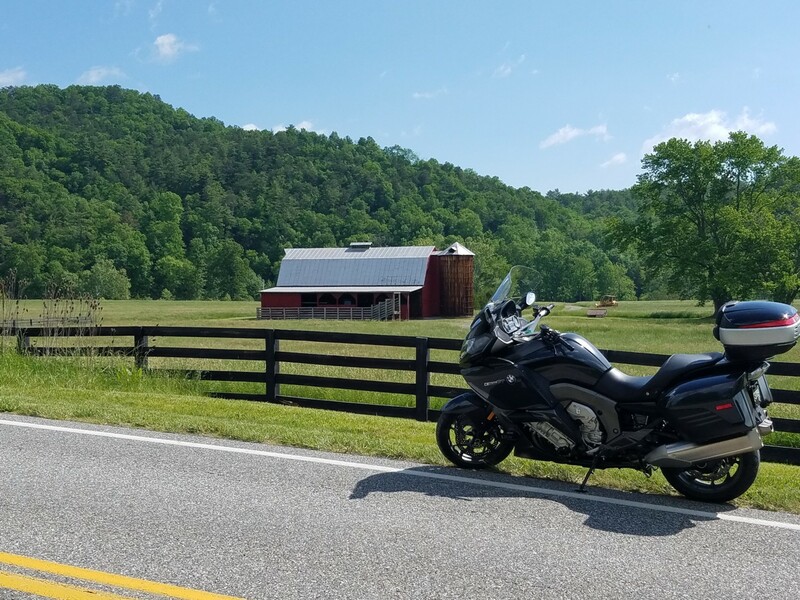 While at our recent year end I-BMW Deals Gap Rally a group of us were riding through Townsend, Tn when the back end of my K1200S started feeling squirrelly as if I had a low tire.. Not quite a flat. Just low. The movement was bad enough that I chose to stop the group and check it. The tire pressure was perfect.. WTF?!. I spoke to two buddies riding behind me and both said that they also noticed a high crown in the road and some irregularities in the pavement, but the problem did NOT manifest itself on their bikes like the Power RSs did on mine... ie... feeling like riding on marbles. We got back on the road and once we hit another type pavement.. the problem vanished. Once more on this trip I experienced the same problem, but only for a few seconds on another road which also had an irregular surface. I'm convinced that this "issue" is due to Michelin's new Adaptive Casing Technology. Did it freak me out? A little.. yes.
" My name is Heidi Goehring and I was wondering if you might add the "Rally for a Reason" that I'm chairing with MOA Ambassador Brian Manke. It's the 47th Annual Wisconsin Dells BMW Rally being held at Easter Seals Camp Wawbeek, 1450 State Hwy. 13, Wisconsin Dells, WI, September 8-10, 2017 (early arrivals welcome). The camp is 400 acres of pristine woodland -- it's like a state park! The rally benefits Easter Seals (ES) in that $10 of every rally fee goes to ES. ES also offers bunk rentals (for those not wishing to camp) and an on-site breakfast (Saturday) for additional small fees. On Friday our rally features hot dogs and chili until gone with live music by grammy nominees Reverend Raven and the Chain Smoking Altar Boys with special guest (also grammy nominated) Westside Andy. Saturday features one of the best darn pig roasts you've ever tasted followed by the awards ceremony and national touring band Mostly Water. The local Lions Club manages our beer tent and sells grilled food for those wanting lunch onsite or a late night bite. " Mark it on your calendar, friends and help out Easter Seals..
3. 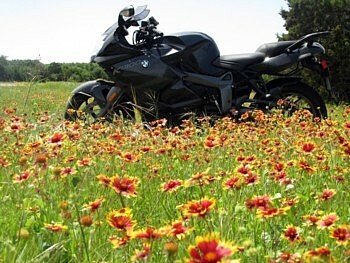 Picked this up at I-BMW.com - BMW Motorrad Calls all R1200GS and GSA Owners for Safety Check. Almost a recall for the 2013 GS / GSA and up- If I had a GS, this is something I'd check after every ride. AdvRider has recorded a few instances where the fork completely separates. Not good. On the street the risk of failure is likely near zero but still ....... Feelin' lucky? 4. Looking for LED Turn Signals for your late and some early model BMWs? We're hearing good things about the kits being sold by weisertechnik.com. A customer just told me his are super bright, Can-Bus compatible, and the install... direct plug-in. no splicing.. Chimp-easy taking only 5 minutes per side. At $85 for a pair... look no further..
5. We just got notice from Hornig of Germany that they have some exhaust protectors for the 2014+ R1200RT on their menu.They are made of high-quality aluminum, fit perfectly to the design of the BMW R1200RT LC (2014-, ) and are sold as a set (left and right)... I like these. Sleek... Well made..Unobtrusive.. and the cover up a bit of the ugliness of those exposed, discolored header pipes. Cost looks to be around $100US or so.. You can buy direct from them or Pirates Lair gets regular shipments from Hornig if you'd rather go through us..
1. 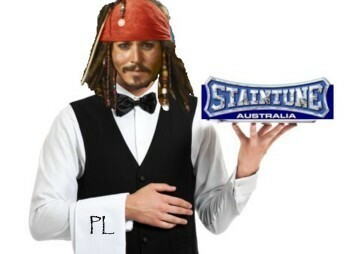 Product Alert: As per the blurb above... Staintune Exhausts are back on the Pirates Lair menu. For how long? Your guess is as good as mine.. Apparently Staintune is up for sale, but will continue producing kits in the interim. The following wordage is on their website. (Pasted below). We're hoping the future owner will allow us to continue to sell this magnificent product. I absolutely love Staintunes. Lets pray the brand (and the quality) continues for years to come and doesn't die off due to "feel-good" government regulations down under. We're wishing the current owners the best during the months ahead..
May 30, 2017- BUSINESS FOR SALE. RARE OPPORTUNITY- Iconic Australian Motorcycle Exhaust Manufacture of over 30 years. This is the first time Staintune has been offered for sale. Company will remain fully operational during this period. Staintune Aust Pty Ltd. We are currently open to written expressions of interest. Initial contact must be in writing. Please post written inquiry to the attention of: Adam Greenwood Po Box 106 Bellingen 2454 NSW. Thank You. 3. New Product Alert: As per the blurb above.. Pirates Lair is once again carrying the entire line of Akrapovic exhausts. Currently we have pages up for the following bikes.. BMW K1600GT/GTL, K1300S, K1200S, S1000R, S1000XR, K300GT, and slip-on kits for the S1000RR. I'll have RR full systems page up soon. Working on it as we speak. We've been given permission to price match with any price posted in the US.. Cancellation policy is two weeks notice. They will invoice you through SQUARE.